Commercial real estate can be a lucrative field for those who can survive or even thrive on the profession’s demands. If you believe this industry equals fast money and minimal work hours, however, it may not be for you. There are certain skills, considerations, and duties anyone should examine before becoming a commercial real estate agent, a profession that can be both rewarding and unpredictable. An agent’s salary is based on commission. Some larger firms may offer a small supplemental salary, and others may let you draw against future commissions, but a commission is the primary source of income. Like a residential agent, a commercial agent usually retains a 3% fee on all sales and leasing transactions. The brokerage firm will likely receive 35% to 40% of that fee, which is typically paid 30 to 60 days after a deal is complete. Commercial deals can be extremely complex and time-consuming. It may take six months to a year for the parties to settle on a sales price, secure funding, sign the paperwork, close escrow, and assume ownership. Leasing transactions usually take less time, but you have to wait for the lessee to assume tenancy before receiving the full commission. You need to be comfortable receiving paychecks sporadically and must go into every deal knowing you may not see the fruits of your labor for a long while, if the deal closes at all. A backup fund with six months' to a year’s worth of expenses is essential for commercial real estate professionals. This fund is especially important at the beginning of your career and during down times in the market when activity drops. Successful agents are successful salesmen. The best ones know all the power players in their markets, which includes the competition as well as potential clients. They proactively seek out leads and aren’t shy about introducing themselves at a networking event or during a cold call. Most agents are social, confident, trustworthy, patient, and persistent. They have to work hard to obtain every listing and client and must move fast when opportunities arise, lest their clients are left behind. Agents spend much of their days trying to convince total strangers to jump into the market with them as their representatives. Relationships with current and past clients must also be maintained, as loyal clients will not only retain their agents for future transactions but will refer them to others. Making and maintaining all these connections take time. Long days, late nights, and weekend appointments are to be expected. Many clients also have extremely busy schedules, which may result in missed meetings and constant rescheduling. Your professional and personal lives should remain flexible to accommodate the client. Every state requires a license to sell commercial real estate. It is obtained by passing a written test that is administered after relevant coursework is completed. Most states make prospective agents complete 30 hours to 90 hours of courses, though a Bachelor’s degree in real estate may bypass this requirement. Much of the coursework can be completed online or through classes at a community college or university. Continuing education courses are needed to renew your license every two to four years, depending on your state’s requirements. You should read relevant trade publications and news websites, as well as remain active in your respective communities. Clients are typically educated, well-informed, successful individuals and companies who expect their agents to be armed with the latest news and market analysis to help them make the best business decisions. A thorough understanding of economics, finance, and tax law will go a long way. The vast majority of commercial agents work in large firms in metropolitan and urban areas, or in small to mid-sized firms in suburban areas. Some of the largest brokerage firms, such as CB Richard Ellis, Cushman & Wakefield, and Grubb & Ellis, can house 20 or more agents in one office that all target the same types of deals. Those new to the field must walk a fine line between socializing with others and guarding potential leads, so they’re not stolen from under them. The office, like the profession, can be high-paced, hectic, and stressful. Some agents are given little more than a desk and landline to make their businesses flourish. 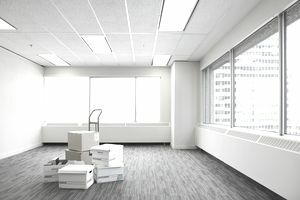 Cubicles, noise, and a general lack of privacy are common in offices large and small. You must become resilient to outside influences and distractions. Agents also spend a significant amount of time outside the office. Leads and clients require a lot of face time and follow-up. Listings must be understood inside and out. A diligent agent will also survey the competition, observing what other companies and investors are attracted to based on their given market’s dynamics. A clean car, polished appearance, and knowledge of building and neighborhood layouts are strongly encouraged. It isn't a job of driving the prospect around looking at properties. Many will come to you with specific requirements and task you to locate the properties that meet them.